PrimeWritings.com and the detailed review with all the benefits, testimonials, coupon codes the place can give! PrimeWritings.com website opens to a crowded and disorganised home or landing page. It is full of endless text and padding in very small type which is difficult to read and, in some places, makes no sense at all. Mostly it is very badly worded, and the English leaves a lot to be desired - you inevitably have to ask the question as to whether the essays, too, might be of the same standard. Prime Writings has been around for over nine years now, so they are a long established player in the market. They are a middle of the road company with reasonable feedback and reasonable prices; but do you want, “reasonable” as your essay result? 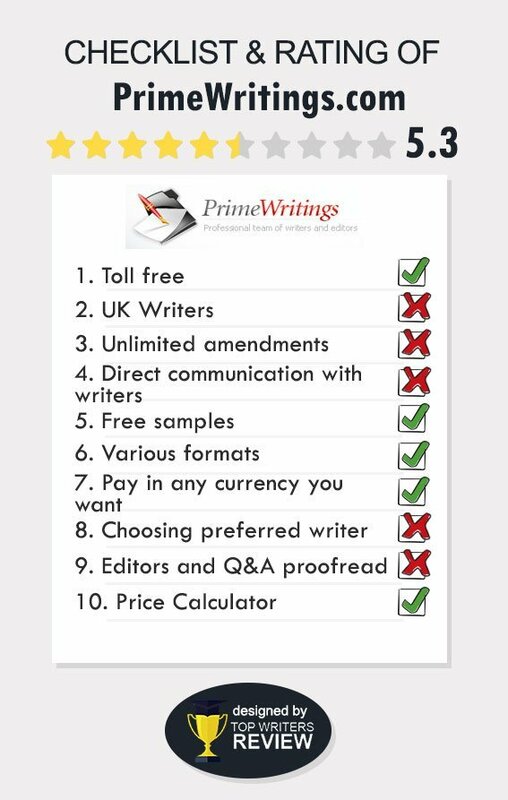 PrimeWritings.com services are both comprehensive and well-listed here in the small print at the bottom of the landing page - they are confusing, and not in any particular order that we could see, but they are all there if you have a few minutes to pick through them. Prime Writings customer reviews are, on the whole, complimentary about the services offered here. The writing is shown via a dozen or so example, or sample papers which are downloadable as PDF files so that they can be studied and looked at in more detail. We checked a couple out, and they seemed to be written relatively well - without blowing us away. Our doubts come when we look at the writer’s description section and find that there the writers are described as having a degree or masters, but there is no proof of this at all. There are no biographies or profiles of the writers nor any way of getting in touch with them directly in order to ask questions of them before engaging their services. Prime Writings review sites are also critical of the lack of proper information concerning the writers and their qualifications. PrimeWritings.com testimonials are internal ones and, as such, should be treated with caution. They are not starred, nor do they have any rating but consist of just one or two sentences which are usually laudatory and glowing in their praise. There were 1,024 of these when we looked. PrimeWritings.com prices are average in the marketplace - we asked for a 10-page, undergraduate level essay with a deadline of 11-days, (the longest they seem to do) and were quoted $159.90 before any discounts were applied. Oddly, we could find no payment method information at all on the site; so, we can only assume that, in keeping with similar companies, the major credit cards, and PayPal are accepted as a minimum. Prime Writings discounts start with an initial 15% introductory offer when you sign for your first order. This is followed by a series of lifetime discounts of 5% for orders of 15 pages or more, 10% for 30 pages or more, and 15% for more than 50 pages. There seem to be no further discount offers. PrimeWritings.com rating is mediocre when it comes to the discounts offered by Prime Writings. PrimeWritings.com coupon codes are only available for the initial opening discount offer. Prime Writings offer a package, worth $80, which gives a free plagiarism report, outline, title page and bibliography, amendments, and formatting; this is available with each order placed with them. There is a very interesting section of the website which shows the current status and activity taking place on the site - how many phone/chat operators are working, how many writers are active, the number of satisfied customers and many other statistics. Prime Writings is not fraud or scam as it has been around for over nine years. It does not release details or information to third parties, nor does it sell on such information. PrimeWritings pros & cons fall on their writing. On the one hand, the writing costs would seem to be quite reasonable and the pricing quite keen - on the other hand, there is a question mark over the quality of the writing and the pedigree of the writers. Ask lots of questions before you take them on and make sure that you outline your requirements very carefully. Prime Writings BBB, (Better Business Bureau) affiliation or membership could not be confirmed. Their writers are not as experienced as it is said on the website. My essay was full of mistakes and was more of a high-school level than senior. I am really disappointed. It's a waste of money. Papers of high quality aren't what this writing company can create! As for me, I didn't like the essay and the term paper that they wrote for me!